It’s been a year now since we are trying to help beginner bloggers to create a successful blog. To provide them more facilities, we have introduced lots of incredible services i.e. Live Blogger Help (for Free). However, now we are heading one step forward to provide yet another remarkable service to Bloggers. 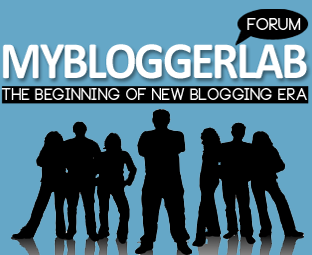 It feels honored to announce that we are launching a Free Online Forum for Bloggers and webmasters. It would be a place where every registered member has the liberty to discuss anything related to the Blogging, Blogger, Search engine optimization, WordPress, Social media and etc. The membership is for Free of course. Anyone can easily register his free account and can get access to the entire forum. The main idea behind starting a whole new community in a form of Forum is to help young bloggers. When our founder (Syed Faizan Ali) was starting his journey in the Blogosphere, there were no such platforms. Keeping that in mind, our team decided to start a whole new platform so that every single person can make use of it. We have added multiple categories so anyone can easily post their respective threads or discussion without facing any problem whatsoever. However, if anyone thinks that some Sections (Categorizes) are missing then he can either contact Management or can use “Suggestions & Complains” Board for any kind of suggestions and complains about the standards of the forum. To make it a meaningful community, we have some ground rules which applies on each and every user of this forum. We would always try to keep the atmosphere of the forum as clean as possible. Inside the forum all members are equal, even the rules and regulations also applies on the each and every member of the Administrators and management department. We believe in equality by giving the same rights to everyone. The registration steps are extremely straightforward. All you need to do is to agree to our terms of service and then fill out Username, Password and Email Address. As soon as your account is registered you can start posting your problems or can even help others. Those peoples who will play a significant role in helping other bloggers would be awarded with stipends on a monthly basis. Furthermore, we will also provide them a higher rank like Moderators, Super Blogger, Helper and etc. For a second time, on behalf of all our staff and crew members I would like to thank every single person who has played a significant role in helping and growing this blog. In coming days ahead, we would continue to provide more such services (for Free). Starting a forum doesn’t mean that our Main Blog would be inactive. Our team would continue to provide stylish blogging tips, Blogger Hacks, and etc. If anyone has any suggestion then, just message us on our Facebook Page, Tweet us @mybloggerlab or use our contact us form. Happy to hear this new from you Syed. I will definitely join your Forum. Happy to hear! It looks great. #1: I have my domain mypremiumtricks on hostgator and I have numerous softwares to create such form. But i cannot remove their logos and branding. So, how have you created this form? #2: I want to guest post on MBL. Please allow me. Where to email you article? Nice Ali, Wish you all the best, i love the design ! 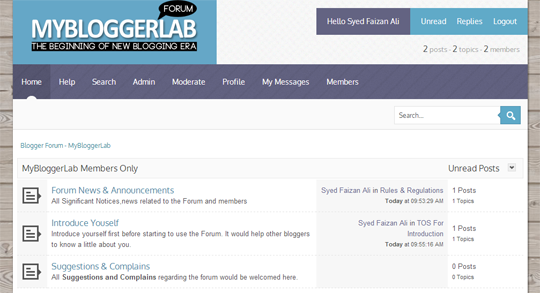 Design of forum is awesome, clear and you used light colors. In future would you like to share how to create a forum? hasnain yes mjhy bi ak ka method pta krna ha? plzzzzzzz faizan method upload kr dyna??????? As per the Guest posts, Sorry mate at the moment we are not supporting guest posts. We have a clear cut criteria and non of the Guest posts matches it. Therefore, we stay away from accepting them. Thanks to our Editorial Team that always brings some smashingly great Articles :). Take Care Pal. That's Great. Feel Free to ask your all questions There. Well, its a custom made platform. We would love to share its tutorial but to make use of it you have to Purchase a Licence from us. can i join your editorial team?